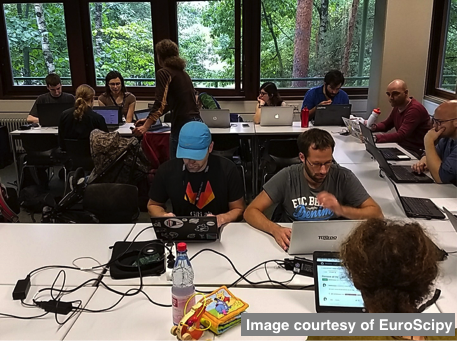 EuroSciPy is a cross disciplinary gathering of sorcerers, knights and rangers united for the good of scientific research, and it is focused on the use and the development of the programming language Python. 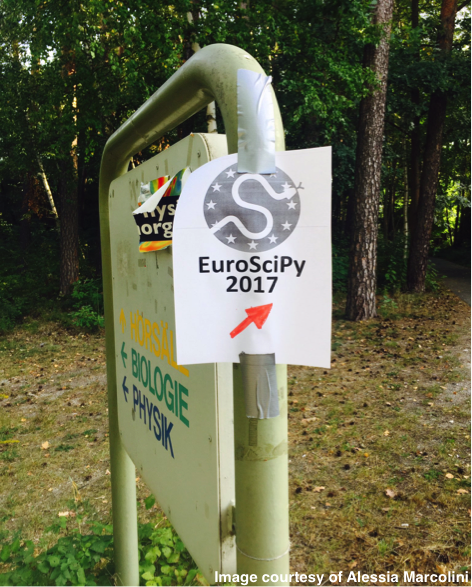 EuroSciPy 2017 was the 10th such conference and it took place in the city of Erlangen, Germany from the 28th of August to the 1st of September 2017. The conference aims for participants to show their latest work, learn from each other and collaborate on developing projects. All these are achieved through multiple days of tutorials, talks and sprints. Scikit-learn with Olivier Grisel and Tim Head. Material and video (part 1 and part 2) are available online. Advanced Pandas with Joris Van den Bossche. Material and video are available online. Networkx with Mridul Seth. Material and video are available online. Scikit-image with Emmanuelle Gouillart. Material and video are available online. Cython with Stefan Behnel. Material and video are available online. SymPy with Sartaj Sing. Material and video are available online. 24 different talks covering a range of topics such as psychology, earth science, machine learning, optimisation, game theory, deep learning and software testing. There was a single stream and most of the speakers were given a 15 minutes slot. Both the single stream and the time given can be characterized as features (not bugs) of the conference. A single stream gave the impression that as a participant you did not miss anything from the conference and the talks were short and to the point. Some of my favourite talks included the keynote How to Fix a Scientific Culture: Psychology as a Cautionary Tale and Paragon by Julia Rohrer. Julia spoke about the field of psychology and the struggles within the field due the lack of open and reproducible software code and open data. I enjoyed how through her personal experiences she gave us examples that all researchers in the room could relate to. I was fascinated by the talk Working with Audio Data in Python by Bastian Bechtold as it was the first time I saw how audio data can be handled using Python. Lastly, GeoPandas - geospatial data in Python made easy by Joris Van den Bossche was a great introduction to the package, illustrating several beautiful data visualisations you can very easily produce. Fellows and friends of the Sustainable Software Institute, including myself, attended and presented at the conference. Alice Harpole presented how we can test scientific code, Thomas Kluyver spoke about testing Jupyter notebooks and Vince Knight spoke about an experiment with lizards and the evolution of cooperation. I gave a talk on accessing open research literature using Python. The program of the conference is public on the EuroSciPy 2017 website and recordings of the talks have been uploaded on the YouTube account. Day three finished off with poster presentations, including a poster by me. Day four came to an end with a series of lightning talks. 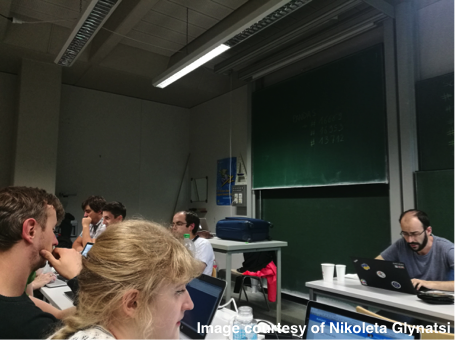 The last day has been the day of the sprints where all the remaining participants were given the opportunity to contribute to several projects, listed on the conference’s syllabus. During the spring several pull requests were opened, great discussions were made and everyone got to enjoy a few slices of pizza. EuroScipy has been a great experience to show my work through my talk and my poster presentation. The crowd was more than welcoming, the single stream of the talks made it possible to catch up with the entire conference and the welcoming city of Erlangen gave the opportunity for great discussion over scientific research. The EuroSciPy community are well aware of the issues modern research is facing due to poor software reproducibility. Several attendants have been very interested in the goals of the Institute and that could inspire the beginning of a similar community across other countries in Europe. EuroSciPy felt as the right conference to discuss issues which are immediately related to us as researchers and as sustainable software fellows: how software developers that found their way into research projects are treated as sorcerers from their team, researchers with the nobility of a knight documenting their packages and writing software tests for the common good, and how through work, continuous improvement and conferences such as EuroSciPy you can gain the wisdom and perceptiveness of a ranger.